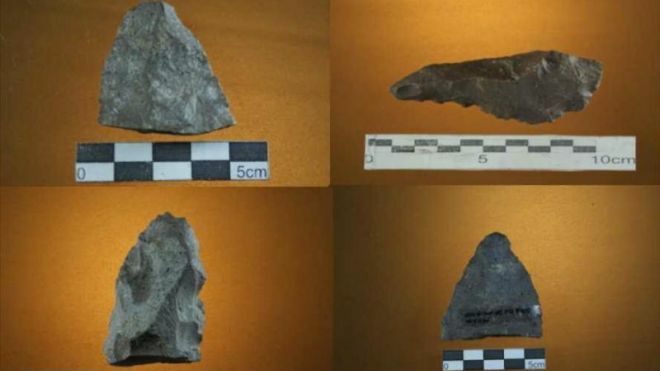 A team of Mexican archaeologists has discovered hundreds of rudimentary man-made tools and artifacts dating back to the Early Holocene era (between 8,000-11,000 years ago) in the northwestern state of Baja California Sur, the National Anthropology and History Institute, or INAH, said. The objects were found at an archaeological site known as El Coyote, located in the Los Cabos region, the INAH said, adding that they "bolster the hypothesis" that the first colonists of the hemisphere populated the region via watercraft migration, following coastlines from northeast Asia southward into the Americas. The researchers found cut and polished seashells, fishing devices and stone tools used for cutting and scraping (choppers, percussive devices, planes, scrapers and knives) that date back between 8,600 and 9,300 years. Those tools were used to work with plant fibers and wood, as well as for prying open mollusk shells. Archaeologists have found similar artifacts in that region over the past three years, leading them to believe that the first settlers of the Americas moved down the coast and arrived what is today known as the Baja California peninsula during the latter part of the Early Holocene era. Human skeletons have not yet been discovered and therefore it is "impossible to know to which ethnic group (the inhabitants of El Coyote) belonged," the INAH said.